Also known by the title Kitten's Story: the Adventures of Chatran, it is an adaptation of the movie The Adventures of Milo and Otis. The game stars Milo, the lovable cat and takes place over the period of a year, 12 months with a day and night stage for each month, so 24 stages in all. 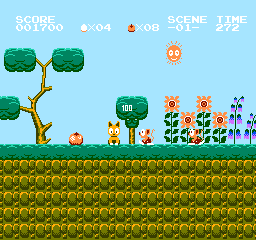 Each stage is short and the goal is to navigate Milo from one end of the stage to the other. Enter the exit at the end of the stage to tally your points, and begin the next scene. Milo will die on contact with any enemy. He must collect eggs to drop on top of enemies. For the first of the game these can be scarce so it's a good idea to save them for tough areas. You can get eggs and other items out of trees by jumping into them and the items will fall out but be wary, in later stages enemies can pop up as well. If you jump on top of a branch, Milo will stomp it, sending either snowballs or fruit downwards, depending on the month. The fruit can be collected but the snowballs can't be but they can both kill enemies beneath the branch. Milo must reach each scene's exit before the time runs out. 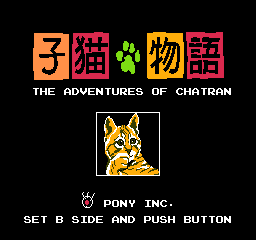 Game Produced by Pony Inc.